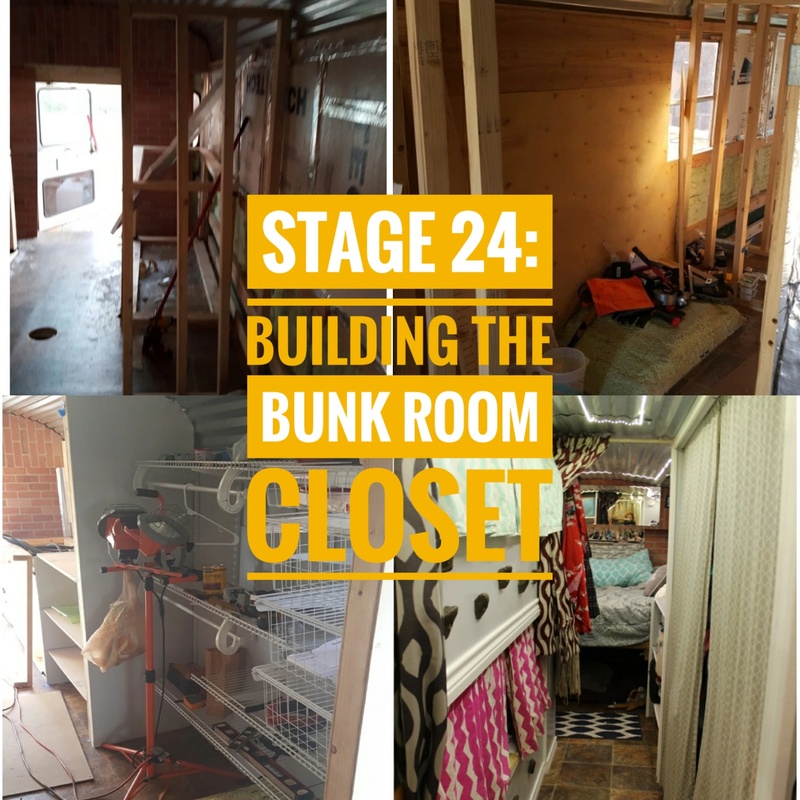 Since we started with the bunk beds and the last thing to build out was the closet, we went ahead and finished that out. We framed the walls with 2x4s, just like every other wall and secured to the studs that run horizontal on the sides and to the plywood under the floor. We used the 1/4″ plywood for these walls on the side of the bus/interior closet. Less weight and I only needed the studs for my closet system I wanted to hang. NOtice below that we added a piece of wood across the top of the closet from one end to the other. We did this on every closet we built, including the bunks and bathroom. This also allowed us to add trim later as well as keep it all secured. We used the same 1/4″ plywood for the interor side walls too. We used 3/4″ on this side, which is my closet, so it could support the shelves we would be building. Notice the top of the walls scribed to fit the grooves of the ceiling. I also insulated the space b/w inside of these walls too with foam board, as mentioned in previous posts. Add a curtain and trim and done! When it is clean it looks great! The bunk Room thoroughly gets used on inside days! I forgot to mention, we also built a box over the wheel well, see it under all the crap? The box over the wheel well is also secured to the wall/studs with L brackets so it does not move in travel. It is a great spot for my printer, Big paper we use for projects, bedding containers, and kid books. The main shelving on too hold toiletry extras,.paper towels, Tp, towels, and an office supply 3 drawer unit. The kids each have their own shelf and rod for clothes, toys, and books. The drawer system is 4 drawers. Each child has school stuff in a drawer, I have a craft drawer, and the smallest drawer is for the animals brushes/tooth care/backpack, etc. I have loved using large containers with lids.for the kids clothes and organizing boxes. I may buy a shelf system you hang from the rod to try a new way of their clothes being organized. It is all an experiment really!